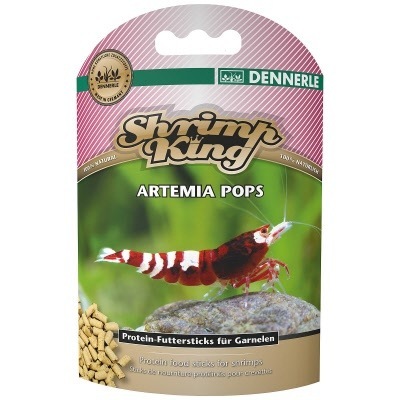 Dennerle Shrimp King Artemia Pops are sure to be a hit with your shrimp. These sinking food sticks are made of soy bran with valuable Artemia and Daphnia. Artemia Pops crumble effortlessly to make a “food carpet” in your tank, ensuring that every animal can reach the food. 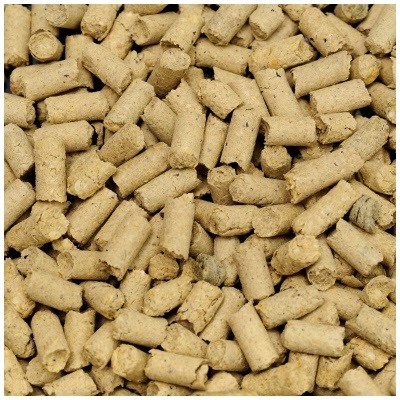 These pellets are a nutritious dietary supplement and snack that help support balanced development, vibrant pigments, and plentiful reproduction. Artemia Pops are also suitable for crawfish, dwarf crayfish (CPOs), crabs, long-arm shrimp, and snails. This food does not contain any artificial colors or preservatives, and is free of fish meal. Feeding recommendation: Feed about one piece per 20 dwarf shrimp. Take out any uneaten portion after 24 hours. Soybeans are known as a high-quality protein. These legumes are a source of cell protection micronutrients such as folic acid and selenium, in addition to important amino acids, vitamins, and polyunsaturated fatty acids. Soy beans also have essential minerals like calcium, magnesium, iron, and zinc. Their dietary fibers aid with digestion. In the wild, shrimp are mainly omnivores. Although plants make up most of their diet, animal proteins are also essential. Tiny crustaceans are part of their natural diet and are a key component of balanced nutrition. For this reason, Artemia Pops contain natural brine shrimp species (Artemia) and water fleas (Daphnia). These crustaceans have a material structure that is comparable to freshwater shrimp. As high-quality natural food they deliver the adequate amino acids and fats. The chitin of their exoskeleton functions as digestion-enhancing fiber. Valuable minerals support successful molting and form a solid shell.